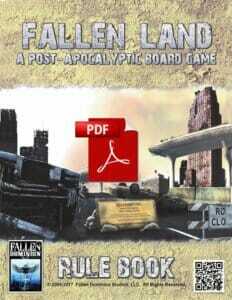 Fallen Land: A Post-Apocalyptic Board Game is a an massive thematic game for 2-5 players. 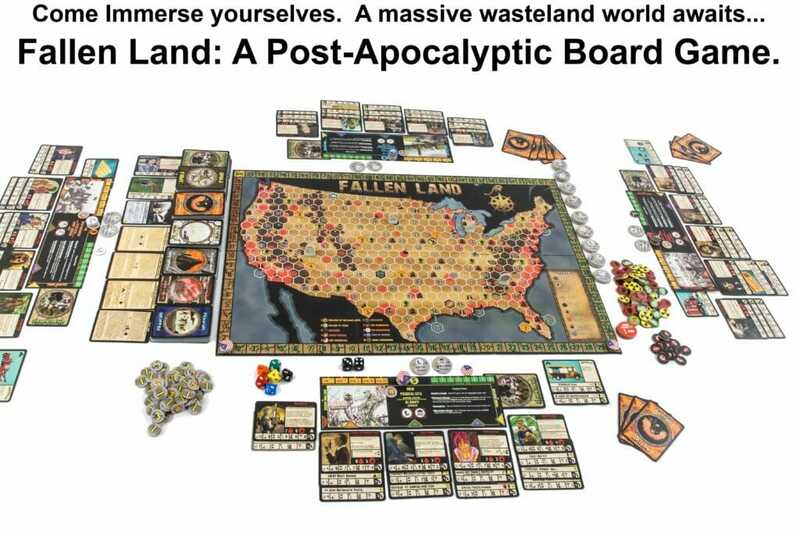 It combines the elements of an epic strategy board game, with card building, light role-playing and is driven by macabre stories of a world gone mad. 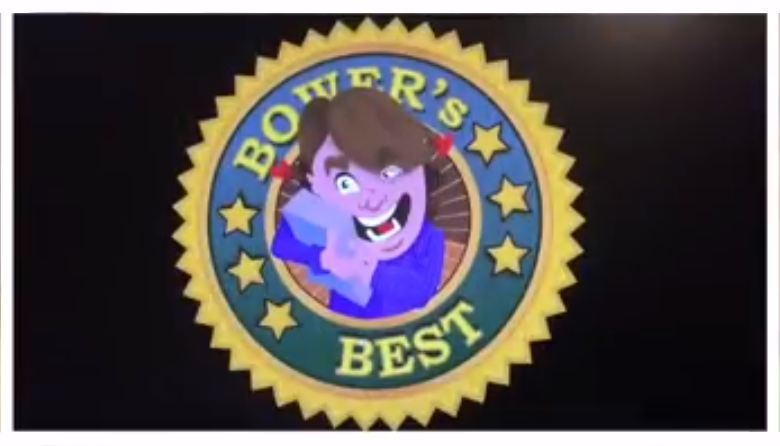 The game features adventure, politics, economics and delivers unlimited sandbox style game play. Each game of this massive world the variables will change: the cards, player interactions, stories, strategies and threats. You will never have the same experience twice. The game has a strong pulp influence, but its roots stem from Cold War studies. We have expanded upon this to arrive at our game’s premise: What would happen after a nuclear and biological apocalypse? Our answer is Fallen Land. As a player, YOU are the leader of a unique faction of survivors competing for primacy in the ruinous aftermath of post-apocalyptic America. Direct your party of characters to explore the rugged landscape, establish your territory and solidify your agenda. You will also have to manage and enhance your town, protect your citizens and secure resources. Players will also have to make and break treaties to endure, amidst a myriad of bribery, betrayal and hubris by the other players. But that is just where the adventure begins! 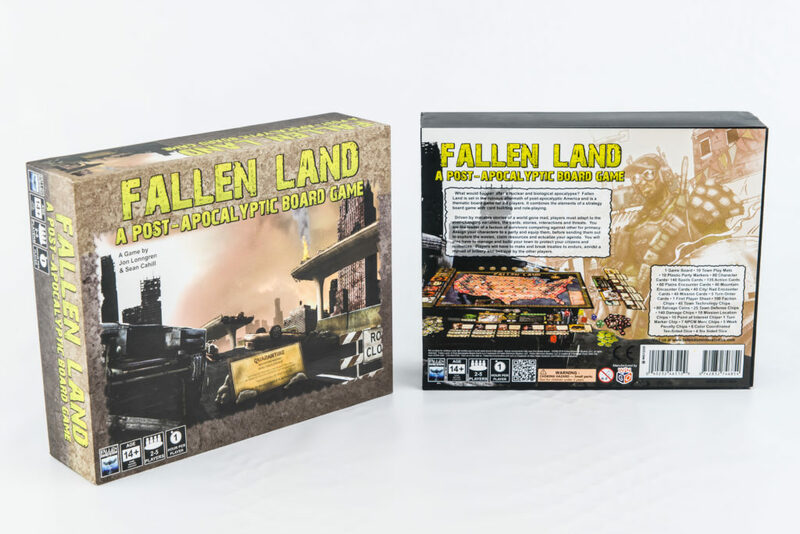 A Journey Into Darkness is the exciting first expansion for Fallen Land: A Post-Apocalyptic Board Game! 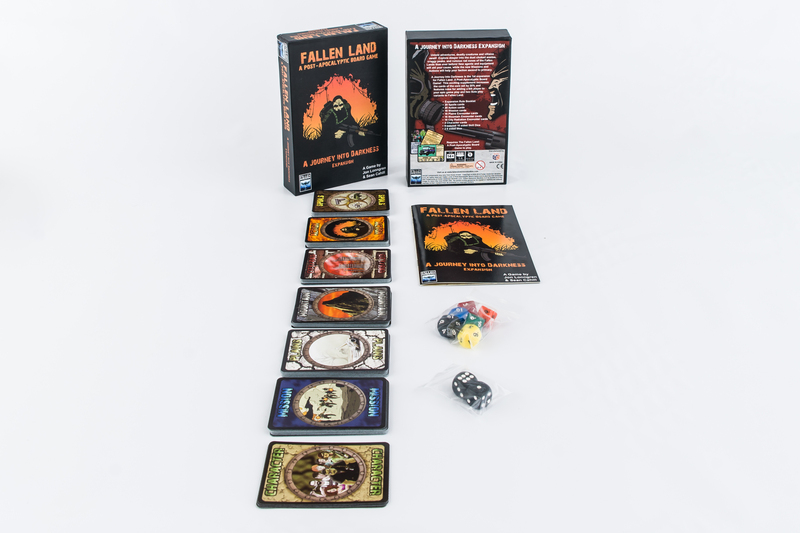 It includes rules for two Solo Variants (with differing levels of challenging game play), rules for adding a sixth player to create an Epic Game, and a slew of Optional and Advanced rules for the 2-6 player game. It also increase the cards of the Core Set by 20%! Game of the Year 2017! 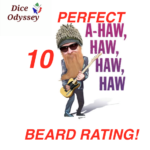 Dice Odyssey Full Beard Award, A Perfect 10!